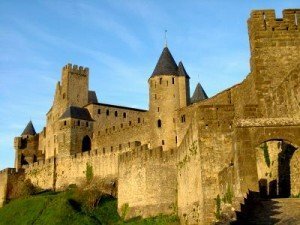 You wont find many places quite like Carcassonne. Well known as a walled city (cité) , it has been occupied since 6 B.C initially by the Gauls and then the Romans supposedly around 4 A.D. The castle was built in the 12th century and sits on the west side. The city came under the control of Simon de Montfort in what became known as the Albigensian Crusade. They set to work on fortifying the city during the thirteenth century. The building of an outer wall helped make the city a great fortress for its inhabitants. Things changed with the signing of an agreement called the Pyrénées Treaty which meant the town was no longer need as a strategic point. Eugène Viollet-le-Duc headed a huge rebuilding project in the nineteenth century allowing for future UNESCO approval.